AT&T shareholders are frustrated. They are not getting the dividend payouts and shareholder value they expected after AT&T put itself $170 billion in debt last year — the highest debt load of any non-financial American corporation. As AT&T has bet big in recent years on video-related acquisitions, including DirecTV and Time Warner (Entertainment), investors are skeptical AT&T can properly monetize its video business. Many have sold shares after criticizing company executives over the company’s strategy and high debt, driving AT&T’s market capitalization down to around $225 billion, comparable with considerably smaller Verizon Communications. 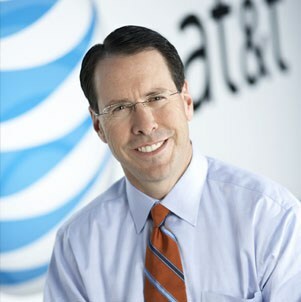 But no worries, AT&T CEO Randall Stephenson, has reassured. AT&T expects those investments to yield results this year, helped by forthcoming broad price hikes for AT&T’s consumer services. According to AT&T, customers are irrationally paying too little for AT&T’s video-related services, which include DirecTV (~19 million customers) and DirecTV Now — the two-year old streaming service that has attracted nearly two million subscribers. Although DirecTV has recently been extremely aggressive about offering deep discounts to convince satellite customers to stay, AT&T plans to pull back on those discounts as two million DirecTV customers see their two-year contracts end this year. Instead of granting renewed discounts for signing another contract, AT&T plans to deliver significant rate increases. 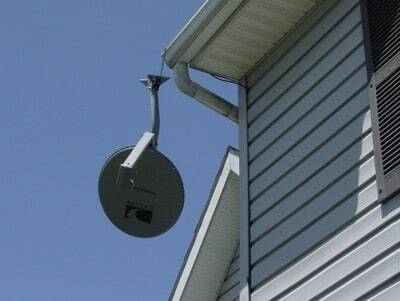 That may prove a difficult sell for DirecTV satellite customers, who have recently been abandoning the satellite platform in favor of cheaper streaming TV alternatives. Even with package discounts, DirecTV is the pay television industry’s most expensive provider, collecting an average of $120.36 a month for its TV packages. 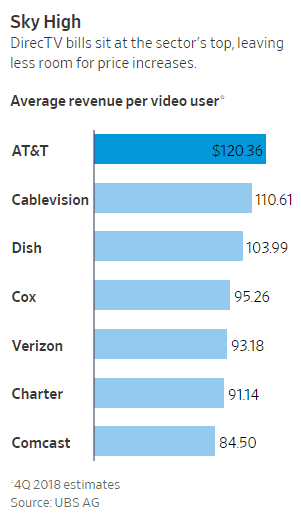 In contrast, Dish Networks gets an average of $103.99, Charter Spectrum earns $91.14 and Comcast, $84.50. 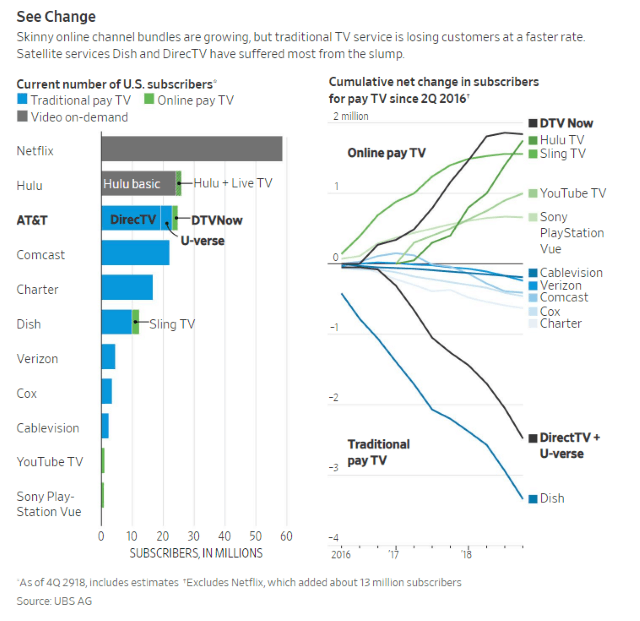 DirecTV defections, largely over price, have been growing at an accelerated rate, with 1.4 million customers turning their back on the satellite provider over the last two years. Analysts expect AT&T will report 300,000 more lost subscribers in the last three months alone. At that rate, AT&T will lose at least $1 billion in operating profits in 2019 from its declining satellite TV unit alone. DirecTV Now customers, who already absorbed a $5 rate hike last summer, and will face even more rate increases and channel reductions in 2019. Stephenson expects DirecTV Now’s price point to be in the $50-60 range, which means many customers will likely face an average of $10 in rate hikes this year. For AT&T, that would deliver “the right price” and gets the service “to where it is profitable,” according to Stephenson. But customers are likely to balk if AT&T reduces channel lineups at the same time it raises prices. AT&T has already faced substantial DirecTV Now customer defections after last summer’s rate increase, and the company has also reduced new customer sign-ups by cutting back on new subscriber promotions, which often included a free set-top streaming device. Waiting to pick up exiled streaming and satellite customers are AT&T’s competitors, especially Google. YouTube TV has proved to be a DirecTV Now killer, now charging $40 a month for 60+ channels. It also comes with an unlimited cloud DVR feature and a complete lineup of local channels across most of the country. YouTube TV is reportedly still growing, attracting more than one million customers so far. AT&T executives claim the service is popular only because Google is suspected of subsidizing what they believe to be an unprofitable venture by around $9 a month. Investors are also unhappy about customers slimming down their TV packages, because average revenue per customer is cut in the process, sometimes dramatically. Wall Street was accustomed to video packages bringing in at least $100 a month. In many cases, that revenue is cut in half after a customer switches to a streaming provider. AT&T hopes investor pressure on those new ventures and ongoing wholesale programming rate increases will both conspire to bring back familiar annual rate hikes for streaming services as well. Programming cost inflation almost feeds itself. As programmers set new wholesale rate records for their networks, other programmers believe there is now room to raise their wholesale rates as well. Programming costs are not just important for consumers, either. Wholesale programming rate inflation was one of the reasons AT&T spent $49 billion to acquire DirecTV. Volume discounts for DirecTV meant the satellite provider was paying an estimated $20 a month less on programming than AT&T’s own U-verse unit, which had a much smaller customer base. AT&T’s purchase of Time Warner, which owns several popular cable networks, was also a hedge against programming rate increases because AT&T would effectively pay any increases to itself. The Journal reports AT&T executives were unprepared for the speed cord-cutting has taken hold. Most most under-30 have abandoned the concept of paying for live, linear cable television at any price, preferring a combination of on-demand streaming from Netflix, Hulu, and other video streaming services with an over the air antenna to watch local stations for free. Older Americans are gradually following suit. “There’s no way that we could make the numbers we were told to make,” said Altrina Grant, former manager of a Chicago-area AT&T call center. She said some agents would promise to call back a customer about a request to drop service rather than immediately disconnecting, which would count against their compensation. Irate customers would later call another employee to ask why their request wasn’t honored, she said. “These reps were getting thousands of dollars because they knew how to manipulate the system,” Ms. Grant said. Cyrus Evans, a former call-center manager in Waco, Texas, said employees’ pay could swing between $50,000 and $80,000 a year depending on their performance, which was often influenced by how many disconnection requests they could deflect. Mr. Evans said employees often got angry calls from customers who had been promised their service would end, only to receive a bill the next month. He said the incentive structure rewarded bad behavior. Former AT&T workers said the company launched a new audit team in 2017 to crack down on support staffers making promises they couldn’t keep. Ms. Grant said this initiative led the company to fire some workers but several customer-care executives are still in their jobs. Old habits die hard and looks like it holds true for AT&T. PPPSSSSSTTT you are in a business with competition from all angles now. Streaming television defiantly has some real players and DISH has always been cheaper and soon so will cable. Unwise AT&T trying to pay down debt with rate hikes. You should of concentrated on your wireless and DSL instead of buying your way to prosperity. Times are going to get rough in America once this recession fully kicks in and television is not a must I hate to tell you, but hey tell your shareholders what they want to hear. Give them the warm and fuzzy feelings that will fix everything. You had to know the low interest money train and false good time economic bubble couldn’t last forever? I have to give Randall Stephenson a lot of credit: he is the prime example of snake oil salesman who will be long gone when this house of cards behemoth of a company that was once a nasty baby bell called Bellsouth finally implodes from the unsustainable debt it is currently holding. I hope many of you have invested in guillotines and pitchforks. I have as want this sickness of greed reigned in. I have been a Direct TV customer for years. Recently I was offered many promotions to leave Verizon wireless for AT&T wireless. After spending many many hours over the past two weeks, only to be told that I would never get my promotional offer, I turned in my AT&T phones and ran back to Verizon. The most disturbing thing I found was the number of wireless professionals working for AT&T that are aware of this massive deception, yet is seems to continue with no consequence. Until AT&T starts submitting promotional offers in writing I would assume that you will never receive what you were offered. Based on my situation, they promise you the world, telling you it will take two to three months to apply discounts. This seems to be no more than an attempt to tie you up until you can no longer leave without paying extremely high fees. Since all calls are recorded, AT&T could investigate these claims and put an end to this deceptive practice, assuming this was an ethical company to deal with. What kind of future does a company have when they anger so many potential customers. This will catch up with them at some point. Maybe I should title this response INVESTOR BEWARE! My Dad owns stock in AT&T. I have been an AT&T wireless customer for 16 years. They were already cost more than other carriers, so raising their rates, again? Doesn’t really promote customer loyalty, therefore I expect the stock dividends to drop as more people leave for more affordable plans. Bundling doesn’t save the customer anything and will cause one to contact AT&T monthly for several months to correct the billing to what was promised. Was a reputable company, no longer. Would not recommend to anyone, and expect to see a major exodus from AT&T for better plans. Guess I had better sell that stock now, while it is still up as far as it is.